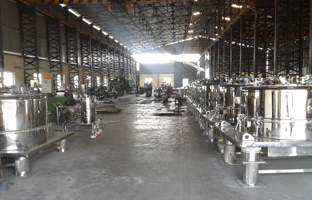 Incepted in the year 1980 in Mumbai, Ace Industries, has acquired a reliable name in the sphere of manufacturing and exporting a wide array of Centrifuge Machines and Calcium Chloride that find wide application in diverse sectors such as oil refineries, food, chemical, textile, sugar and many more. 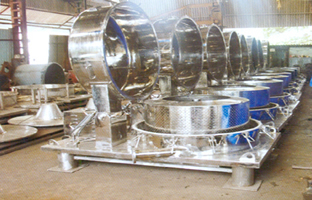 ACE INDUSTRIES is an engineering company which specialises in the design, manufacture and supply of BASKET TYPE CENTRIFUGE to industries like pharma and chemical for their many applications. We have an impressive track record working in this field for over three decades having supplied more than three thousand centrifuges (on turnkey basis all over the world) with exports to countries like the US, UK, Argentina, Jordan, Italy, Thailand, Nigeria, South Africa, Philippines, Malaysia, Bahrain, Iraq, Iran among others. 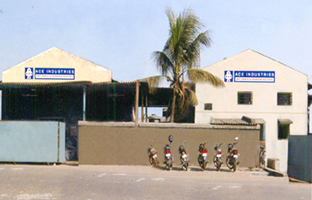 Our manufacturing facilities lie in Maharashtra and Gujarat. Mr. M.H. Makhani, the Promoter of ACE INDUSTRIES, is a UDCT B.CHEM ENGG. graduate who perfectly understands the buyers' requirement and can therefore manufacture to suit their specific requirements. We have also successfully supplied and commissioned many chemical plants for conversion of sulphur to other useful chemicals. Quality has always played a vital role in determining the client satisfaction and in turn the growth and success of the company. 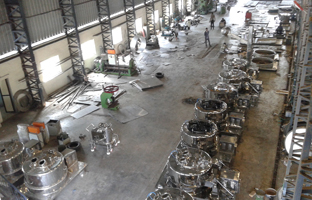 Since our inception, we have always focused our endeavor on meeting the client satisfaction through the supply of un-compromised quality and optimum functioning centrifuge machines of varied technical specifications. Legal Status of Firm PVT. Ltd.
» Brine for refrigeration plants. » Ice and dust control on roads. Quality assurance is one of the essential part of our all business activities that sets us distinct in the competitive market as compared to other manufacturers. Every machine manufactured by us is according to the industry standard quality norms. We make use of extensive quality raw material, which is directly sourced from authorize vendors. This enables us to design and manufacture high quality and durable machines that meet the various requirements and needs of customers positively. Our special team of quality experts keep careful eye over the complete manufacturing process. Moreover, we have also received worldwide appreciation and are rated 'SE 2C' by CRISIL. » Argon welding of S.S. basket, S.S. body and all other S.S. parts as per our & general arrangement drawing. » Running trail of the bearing housing to check the sound and ensure trouble free running of the bearing housing. » Imbalance test load with 2% of the cake load by putting a weight in a corner of the basket & running the machine for hours. Customer satisfaction is the key to our success. We believe that it is very important to keep your clients satisfied by delivering optimum quality at best price. Therefore, we have been working in adherence to the industry standards and promising premium quality range of Industrial Centrifuge Machines, Basket Centrifuges, Chemical Centrifuge Machine, etc. Fulfilling client's requirements in the best possible manner is our sole objective. We value their time and money, hence serve the needs of our clients with cost effective solutions in the committed time frame. We take pride in being the foremost choice of innumerable buyers across the globe. Our effective team is an essential part of our organization that has guided us to reach at the optimum position in this industry. Their positive efforts and hard work have helped us to meet our targets efficiently on time. Our experts are highly skilled and are well informed with the modern trends and technological developments that are present in the market. They help us to establish a set quality standard in all our business proceedings. Our products like Pharma Centrifuge Machines, Basket Centrifuge, etc are produced according to the international standards and the accurate industry parameters. The complete production process is managed by our team so as to avoid any kind of negativity. We are equipped with latest machinery and equipments to carry forward the manufacturing process. Moreover, the quality personals keep a stringent vigil on the finished products as well as the raw materials and basic components that are used during the production. All the business proceedings are carried out effectively by our skilled and talented professionals, which has enabled us to reach out to so many international clients. Our company is engaged in manufacturing optimum quality calcium chloride and Centrifuge machines such as Pharma Centrifuge machine, Manual top discharge Centrifuge Machine, Four Point Lifting Bag Centrifuge Machines, Bottom Discharge Centrifuge Machine and others. These products find applications in diverse industrial segments. We are committed to manufacture superior quality products that have longer service life and sturdiness.